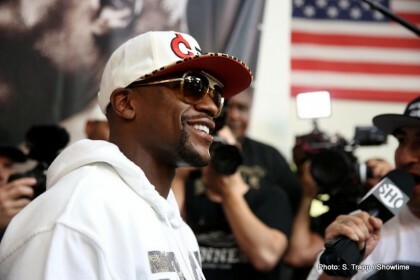 In a talk with ESNEWS, Jeff Mayweather spoke on a glaring double standard that separates two of the top fighters in the sport – Floyd and Manny. It is my opinion that Mayweathers detractors are so hungry to see Floyd lose they will create a fighter who can beat him in their minds, even if he does not exist in the real world. By this I mean overhyping Pacquiao and talking him up to the point where casual fans really believe this is a 50/50 fight. It’s rare that you get a real 50/50 fight in boxing; this is not one of them. A comparison between the opposition faced by these two guys was fair for a period. The pacman beat some legends in his time, particularly when he was moving through the lower weight classes and picking up titles left right and centre. Certainly any name like Morales, Barrera or Marquez would make any resume, but to have all three really is an extraordinary feat. However at some point between then and now something has changed. A Shane Mosley who had just been outclassed by Mayweather and couldn’t even win his comeback bout against a little known Sergio Mora? Shane Mosley had last one a fight in January of 2009 and he fought the pacman midway through 2011. An Oscar De La Hoya who had already lost to Floyd? A Hatton who had already lost to Floyd? Granted Pacquiao fought Cotto first, but Floyd fought him after one of his best wins in stopping Margarito, and at a weight which was an additional advantage for Cotto. From there on out it only gets worse, more controversial fights with Marquez, a Timothy Bradley who was untested and still lost to him, then a brutal KO loss to Marquez followed by fights with Rios and Algieri. I am not even going to explain why Algieri didn’t belong in the ring with the Pacman and Rios, whilst tough, was made to order for Pacquiao and didn’t have a hope. Getting back to the interview, Jeff Mayweather said that the choice of Algieri was so that Manny could get a KO victory, but even that didn’t happen. Pacquiao was able to Algieri down over and over again, but couldn’t put him away and ended up having to take the points victory. Nevertheless the performance was impressive enough to start the fans clamouring for the super fight yet again, and this time they actually got it.